Otter is a newborn conductive warmer designed specifically to allow rural hospitals with limited resources and inexperienced staff to successfully treat premature and low birthweight newborns who are especially vulnerable to hypothermia. Unlike the incubators and radiant warmers a rural hospital might receive as donations or through a government purchase, the Otter Warmer provides effective newborn warming that is “easy to use right and hard to use wrong”--in other words the device eliminates the most common sources of product failure. Each year over 4M infants in developing countries die within a month of birth due to complications of prematurity, low birth weight (LBW) and infection (Lawn 2005). We could prevent more than 1.3M of these deaths by providing at-risk newborns with a warm and clean environment in which to grow stronger. Hypothermia is common even in tropical environments, and is increasingly recognized as a major cause of neonatal morbidity and mortality (Kumar 2009). Although hypothermia is rarely a direct cause of death, it is a significant contributing factor to newborn mortality due to neonatal infections, preterm birth, and asphyxia (Lunze 2011). Kangaroo Mother Care (KMC), newborn warming through skin-to-skin contact, is ideal for preventing hypothermia (Sachdev HPS, 2016), but not always possible. Vulnerable newborns need another form of active warming if their mother is infectious, if they need other treatments like phototherapy, or even during brief stays away from their mother in the emergency room or in a newborn intensive care unit (NICU). 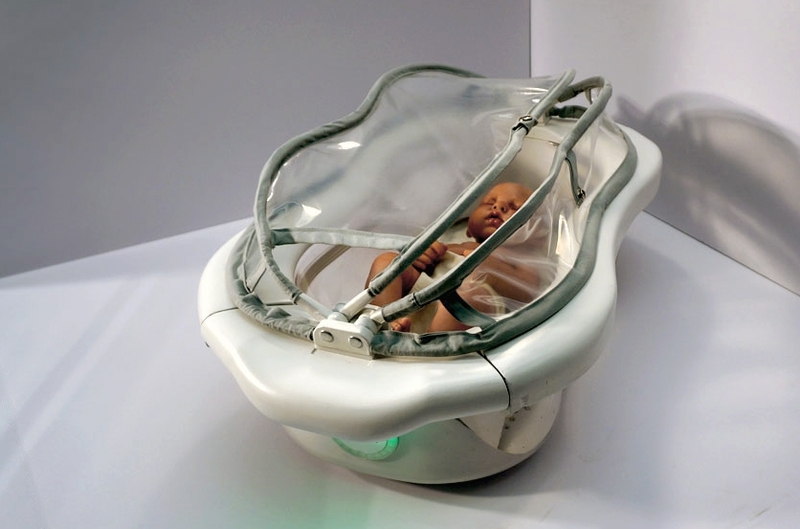 One alternative to KMC is an incubator, a convective warming device that provides warm and humid air that is regulated by measuring the newborn’s skin temperature with a disposable stick-on probe. Another alternative is a radiant warmer, which provides heating through infrared radiation that is also regulated by skin temperature probe measurements. Unfortunately, neither of these devices is well suited to the context of a low-resource hospital: both are complex, expensive to maintain and difficult to keep clean. Newborns are particularly vulnerable to hospital-acquired infections. One Boston NICU technician estimated that it takes 45 minutes to properly sterilize an incubator between patients. Few rural hospitals in developing countries have the resources to follow this protocol. In addition, few can afford to maintain a sufficient number of incubators, so it is not uncommon to find two or more newborns sharing a single device. Operating either warming device without a skin temperature probe creates the risk of overheating and harming the newborn (Amadi 2014). Disposable probes are expensive and supplies are typically hard to find in low-resource settings, so many hospitals are forced to either abandon the warmers or to use them without patient temperature feedback. Finally, devices like incubators and radiant warmers are designed with American or European hospitals in mind. In a low-resource setting, spare parts are hard to source, power spikes and outages are common, and humidity, dust and bugs are tough on any electronic equipment. According to one study (Malkin 2007), up to 98% of medical equipment donated to the developing world from wealthier countries is broken within five years. Otter is a durable, washable warming bassinet designed specifically to allow rural hospitals with limited resources and inexperienced staff to successfully treat premature and low birthweight newborns who are especially vulnerable to hypothermia. Otter will work as a stand-alone device and as a complement to both DtM’s Firefly and to conventional overhead phototherapy devices. To facilitate adoption, the device will comply with existing international standards for conductive newborn warming devices. Otter will build directly on DtM’s experience and partnerships developed during the Firefly newborn phototherapy project. Firefly is now a CE Mark certified medical device that DtM partners have distributed to 23 countries from Afghanistan to Zimbabwe. These Firefly devices have already treated more than 100,000 newborns and are projected to treat more than 300,000 newborns over their lifetime. As of January 2019, Design that Matters has completed four rounds of Otter prototyping, and user interviews and design reviews with neonatology and global health experts in Boston, Haiti, Vietnam and Sierre Leone. Through this rigorous human-centered design approach, we have established the following Otter design principles and key features. Hard to use wrong: simple “plug and play” user interface automatically sets a safe and effective surface temperature. The bassinet only fits a single term newborn, in order to reduce the incidence of cross-infection from newborns sharing beds. Easy to clean: a modern incubator can take up to 45 minutes to clean properly given all of the internal seams and crevices; Otter has a smooth, seamless interior that can be wiped clean with alcohol in just minutes. Compatible with Phototherapy: All newborns receiving phototherapy are vulnerable to hypothermia, so Otter is designed to work with both the Firefly Phototherapy device and with conventional overhead phototherapy devices like the GE Lullaby and D-Rev’s Brilliance. Robust: the Otter power supply will be specified for 100-240V and 43-67Hz to better manage the variations in low-quality mains electricity in low-resource settings. The housing will be sealed from dust, and Otter will contain no moving parts. 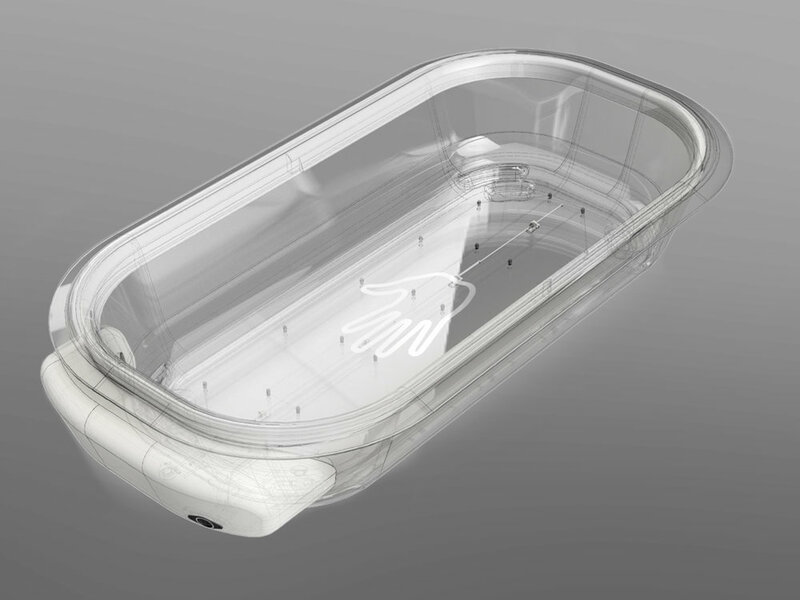 The bassinet will be made from high-strength polycarbonate, which has proven durable in Firefly. 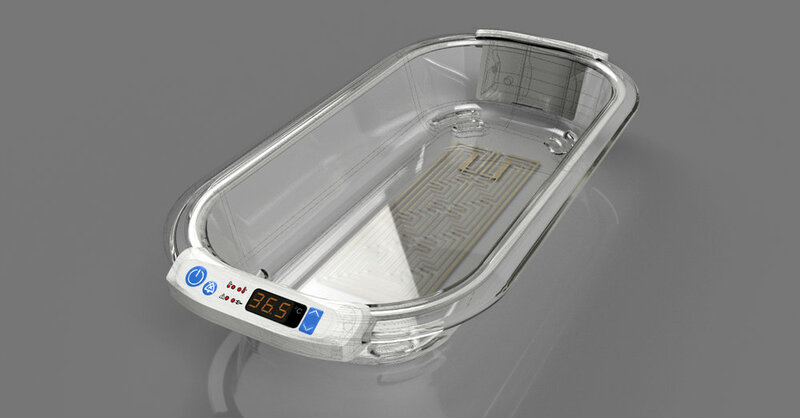 Otter maintains a safe and clinically effective conductive warming surface temperature of 36°C, which mimics a mother’s skin temperature during Kangaroo Mother Care (KMC). We are currently exploring the possibility of a user-adjustable surface temperature within +/- 2 degC of 36 degC. Otter does not require a newborn skin temperature probe for safe and effective operation. This eliminates a major operating cost and a significant source of user-error. Building on DtM’s experience with the Firefly phototherapy device, DtM expects to complete Otter development in early 2020. Working with global health partners in late 2020, DtM plans to distribute 1,000 warmer units and to treat over 500,000 newborns in Asia and sub-Saharan Africa. We expect the impact of Otter to continue beyond the first 1,000 units. DtM’s key argument is that so-called “international” medical device standards, established by governments in North America and Europe, are a poor match for most low-resource hospitals. If we want the international aid community to stop shipping incubators and radiant warmers to developing countries, we have to provide an example of more effective standards. The health impact data produced by this scale of implementation will allow DtM to establish Otter as the “reference design” for newborn warming in low-resource settings. We see growing evidence of support for DtM’s position that international medical device standards are insufficient and often inappropriate for low-resource settings, specifically in the increasing number of government tenders for double-sided phototherapy devices in countries with significant Firefly installations. This is the end game for a product like Otter: changing international standards and thus providing an overwhelming incentive for multinational medical device manufacturers to follow our lead and imitate our products. In this way, we have the leverage to improve the health outcomes for millions of the most vulnerable newborns. Contact us for ways you can get involved! Clips from our latest research trip with the working Otter prototype. We traveled to local hospitals in northern Vietnam. During this summer’s design sprint, the team pioneered some new prototype fabrication methods. Learn how you too can create a high-fidelity user interface prototype using cool tools like a laser cutter and a desktop CNC mill! We’ve just passed a major milestone in the development of the Otter Warmer: the design and fabrication of our alpha prototype, the first iteration to both look like and work like our expectations for the finished product. It includes two key new features: a numerical user interface and a heating assembly manufactured from a translucent polymer film. Support DtM on Kickstarter, get field research gear! We've just launched a Kickstarter campaign to fund the next stage of development of our Otter newborn warmer--and we need your help! This summer we recruited a design team of Autodesk Student Experts to develop an alpha prototype of our Otter Newborn Warmer. Thank You Otter Supporters and Advisers! We would like to recognize the technical experts who have answered countless questions and provided invaluable guidance as we raced through Otter development over the past year. We want to say a quick thank you to our fantastic spring semester student team from Olin’s Affordable Design and Entrepreneurship (ADE) course! Special thanks to the Dong Anh Family for graciously hosting us at their home to follow up with Baby Khang who was successfully treated in Firefly during clinical trials in 2015.